Camp Major Bado Dangwa, La Trinidad Benguet — The commander of the Mechanized Infantry Division (MID) of the Philippine Army awarded medals to 15 cops of Police Regional Office Cordillera (PROCOR) during the flag raising ceremony and Distinguished Visitor Program at Camp Major Bado Dangwa,La Trinidad, Benguet this morning. 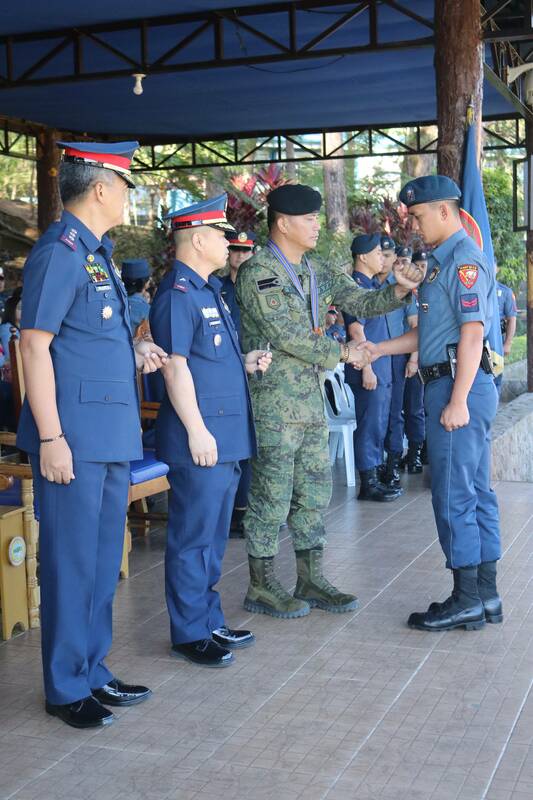 Brigadier General Bismarck Soliba, MID commander led the pinning of nine “Medalya ng Papuri”, three “Medalya ng Kagalingan” and three “Medalya ng Paglaban sa Manliligalig” to the 15 uniformed personnel of PROCOR for their excellent performance on police operations and their profound commitment to duty. Police Captain Juan Carlos Recluta, Patrolman First Class Ben Gabino, Jr. and Patrolman First Class Cyrus Vanci Backen, all from the Regional Mobile Force Battalion 15, (RMFB15) received “Medalya ng Papuri” for their commitment and outstanding performance that lead to the successful search and rescue operations in Sablan, Benguet on January 11, 2019. Same medals were awarded to Police Captain Allanvrix Casia, Patrolman John Macaiba, Jr. and Patrolman Christian Guinnayao, all members of the 1503rd Maneuver Company of RMFB15, for arresting Benny Palason for violation of the RA 10591 or the firearms laws of the Philippines and the confiscation of 9mm Armscor pistol with live ammunition during the conduct of checkpoint at Talaca, Agbannawag, Kalinga on October, 2018. Three Baguio City Police Office (BCPO) cops also received “Medalya ng Papuri”. Police Captain Arnold Lising, Police Senior Master Sergeant Elmerlito Dangli and Police Staff Sergeant Limuel Charopeng were awarded for the successful arrest of Crisostomo Bernal on January 10, 2019 in Baguio City for violation of Presidential Decree No. 1613 or the Arson Law of the Philippines. Further, “Medalya ng Kagalingan” were also awarded to Police Captain Zacarias Caloy Dausen, Patrolman Filbert Flores and Patrolman Jefferson Edal, all from RMFB, for the destruction of Php2,560,000.00 worth of marijuana plants at Mt. Bilis, Sitio Batangan, Tacadang, Kibungan, Benguet on January 17, 2019. Police Executive Master Sergeant Ceasar Cattiling, Police Executive Master Sergeant Anthony Cong-o and Police Master Sergeant Dennis Aranca received “Medalya ng Paglaban sa Manliligallig” for their continues participation to PROCOR’s relentless campaign against dissidents here in Cordillera. Police Brigadier General Rolando Nana, PROCOR Regional Director said that the high sense of commitment, teamwork and devotion to duty in intensifying anti-criminality campaign of the police had greatly contributed in the accomplishment of the PROCOR’s mission.